Two people are injured, one critically, after a slip on Cape Kidnappers in Hawke's Bay today. One person has critical injuries and another has moderate injuries. Both of the injured are being transported to Hawke's Bay Hospital. 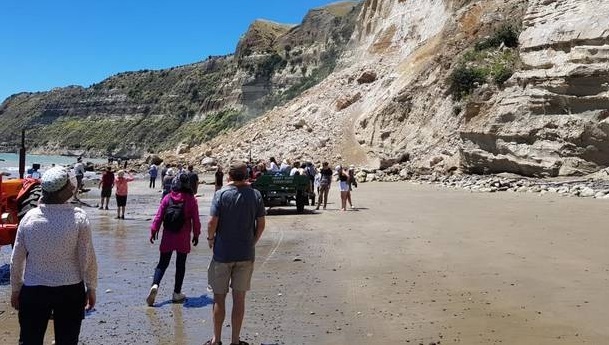 Video from Clifton Beach showed the slip falling into the sea on the northern side of Cape Kidnappers. A man who was on the popular Cape Kidnappers Gannet Tour said the slip had occurred in two waves. The group were on their way to the Cape when the first slip came down, he said. Half of the tour turned back and half, roughly 70 people, decided to press on before a second slip came down, the man said. Police had told him all of the people on the tour were accounted for, he said.